The best strategy for Easter Eggs level 2-2 (formerly level 1-17) is to lob the first White bird between the first two towers. With a little luck, the left tower should fall and the middle tower is pushed rightward. Use the Yellow bird and the next White bird to attack the debris and tower at the right to pop the remaining pigs. The score in the video below is 96,100. Note: In a recent update, the level numbers were changed from Level 1-17 to Level 2-2. 106,370 with one very lucky bird. Tried to do the white bird as shown, but I must have been a bit off. It took them all out in one shot. FIANLY!!!!! THREE STARS IN ALLL LEVELS WOO whoops caps! how 2 get that level? First shot similar to video, but it takes a really lucky shot to get the debris from the 2nd tower to fall back to take out the 1st tower. If you can lob white bird higher (man I hate lob shots) & get it to come down more in between, not touching the 2nd tower, & drop egg when the bird is level with the top of the vertical stone at bottom front of 2nd tower, the egg takes out the bottom leg of the 1st structure, so they both collapse. You still need an awful lot of destruction after this shot for a high score. If you’re lucky enough, you will then get a clear shot with yellow at wooden plank on 3rd tower to take out any remaining pigs & have 2 birds left. This is a good method, but hard to be accurate in small screen hand-helds, I think if somehow throw the 1st White Bird between 2nd and 3rd tower on right and drop egg between them… It could make much more damages on both of the tower… use remaining birds as necessary. This is a sure-shot 3-star strategy. Thank you @karen68 for your post. Used the first shot with the White Bird technique and it worked great. The tip on activation by the vertical stone was the key for destruction. Used 3 birds to obtain the present score. The second two were similar to the E-Star’s video. 2. Line up the belly of the White Bird as close as possible to the base of the sling without touching the base. 3. Aim the Yellow Bird so it travels on a path through all wood to destroy the big pig with the ears and the wood below. One may have to arc or launch YB straight-on to find a glass/stone free path of travel. 4. The second White Bird should take out the stone structure on the far right. Gained over 13k in points. @karen68 @wrw01 strat and tip were me, came back and played for score and nailed #2 slot! Thanks, and Karen are you flinging EE with us now? Nice to see it still works, I don’t think I’ve played this level since I posted that comment 4 yrs ago. So this is sort of a combo of strategies. High lob for first white bird, bit reset if there is a lot of debris remaining in the first valley. Then speed Chuck through the wood under the debris in the second valley. I did better using @e-star‘s third shot (high lob again) as it gave me more time to release the egg. I would like to say that I wish I could disable power-ups in Seasons. I am constantly accidentally hitting the stupid power-ups on top when I’m in a hurry so I have to quickly reset so as not to accidentally use one ? 115k with 3 birds, same first shot, a high lob into the gap between the 1st towers, taking out the bottom leg of the left tower. 2nd a high arc down into the wood in the 2nd gap. 3rd using a high lob again, to take out the last structure. Had pretty good destruction in the 1st gap after the 1st shot, it may help a bit for Matilda to rebound down into the gap to take out some of the wood. thx to @karen68 for video and details. 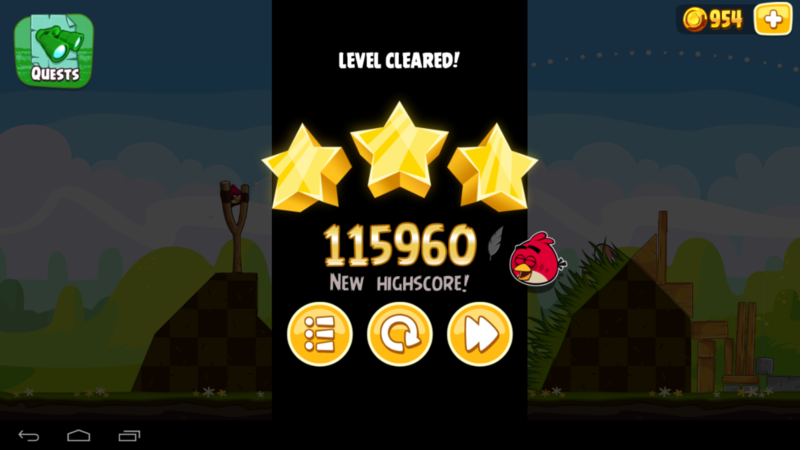 My score was 109,560 and 116,690 and both times it only gave me 2 stars….thought it should take 93,000 to get 3 stars? Anybody know why AB is only giving me 2 stars instead of 3? I think you may be on the wrong level here. What platform are you playing on? I did the same thing as the video on top, but got more luck with the debris. I got 106650 with three birds. Got a one-birder using the same shot shown in video. Unfortunately, there wasn’t enough debris damage to yield more than 72k points (before adding the three remaining bonus birds). I kept at it for another two hours hoping to improve my initial score. Finally, persistence and patience paid off to get my current score of 110790! So don’t despair my fellow bird flingers, may the big L-Factor be on your fingers! I used the first shot from the video but a little more to the left like Karen68 already mentioned to smash the leg of the first structure. For the second shot you should really do more damage than what is shown in the videos. If you can’t get a good angle, try using a high arc and bouncing off the bottom stone of the right structure. Third shot the same. Most of my score is thanks to a very good collapse on the left. @hoser Any memory of how you acheived #1 spot? I see you’ve only entered 2 scores on this episode with no comments, typically this is frowned upon to acheieve a random top score with your boards pretty much empty and is customary but not required to leave a post with the strat you used to acheieve a top score.. any help you can offer the rest of us?